Built in 1883, the Sri Mariamman is the oldest Hindu temple in Penang. Decorated in the colourful and distinctive South Indian Dravidian style, the temple most outstanding feature is the impressive gopuram (tower), which features fascinating sculptures of Hindu deities and floral decorations over its main entrance and facade. The interior of Sri Mariamman Temple is also adorned with various statues of Hindu deities and the main attraction of the temple is the priceless statue of Lord Subramaniam (the much respected Hindu deity) which is embellished with gold, silver, diamonds and emeralds. The statue of Lord Subramaniam figures prominently in the annual Thaipusam festival when it is borne on a silver chariot though the city streets to the temple. Prayers are usually conducted by the temple priests in the early morning and visitors may observe these prayer sessions taking place. If you wish to enter the Sri Mariamman temple, it would be polite to ask permission from any of the priests and please remember to remove your shoes before entering the temple grounds. 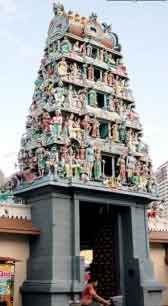 Sri Mariamman Temple is in Central Georgetown on Jalan Masjid Kapitan Kling (Lebuh Pitt), in between Lebuh Pasar and Lebuh Chulia. Walk further north, up Jalan Kapitan Keling from the Sri Mariamman temple, you will find the Kuan Ying Temple (Goddess of Mercy Temple). Just across Lebuh Chulia from the Sri Mariamman temple, you will find the Kapitan Keling Mosque.